Progress... but not by me. I quickly realized that this whole floor scraping project was way out of my league. I might be a tad handy with some things, but I'm kind of a wimp. Scraping this flooring would have taken me and my puny biceps for-ev-er to finish. Enter my brother-in-law, Joe -- he's an awesome contractor here in SE Idaho and we trade office labor for handy contractor-y labor. 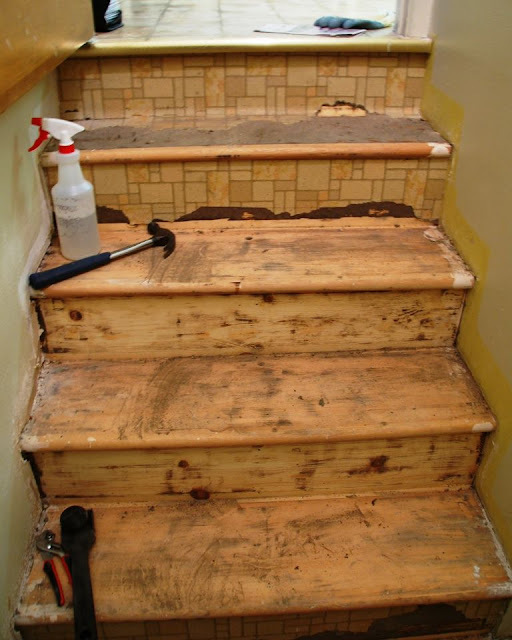 He was nice enough to agree to do the worst job in the world (yep, scraping stairs has stolen the title from wallpaper removal) to pay me back for my amazing skills as a personal assistant/business manager/bossy sister-in-law. He's crazy strong (he can pick up and move large appliances by himself! Leap tall buildings in a single bound!) so he actually removes things when he scrapes the floor, which is apparently a pretty integral part in removing flooring. This is good news, friends. I would have been scraping these steps until school let out for the summer! Haha, I kid. Sort of. Oh man..I would have thrown my hands in the air! That looks like hard work! Can't wait to see them...I just did my stairs too! Hi Anna! I am new to blogging and found your blog via a comment you made on another blog (either The Inspired Room or Thrifty Decor Chic, I'm not sure...I need more coffee!). You can find info (and a link to your blog) on my post. Thanks and have a great day! Woohoo for wood floors under there. I knew there was going to be a light at the end of the tunnel. And how lucky are you to have someone else to help! ?